When we think of coziness during cold days, hoodies come to mind as one of the most comfortable clothes to wear indoors and outdoors. 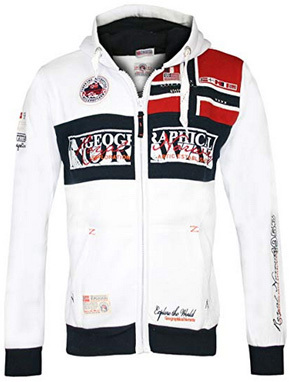 In the past we have looked at several hoodies and fleece jacket styles by different brands and today we will be taking a look at some other similar designs. 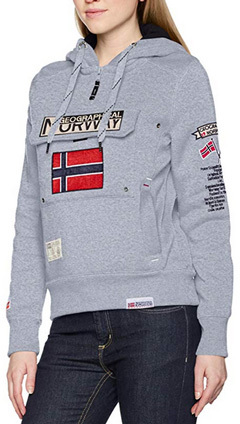 These are various styles of hoodies, as you will see, and the brand of choice for this selection is Geographical Norway. 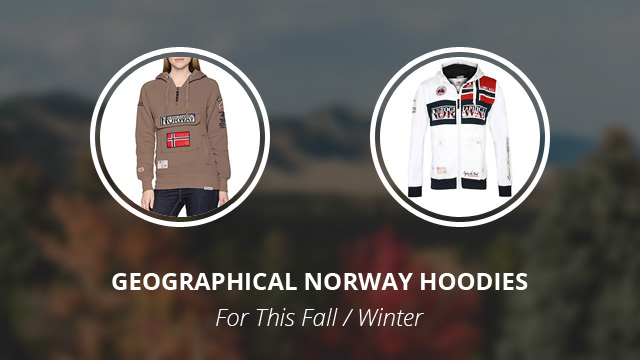 You can find numerous different selections from Geographical Norway here on our site, should you want to get acquainted a bit better with the brand’s other designs. Let’s start off with the women’s hoodies, the first design is the Gymclass Lady Assort A hoodie that is made of 65% Cotton and 35% Polyester. 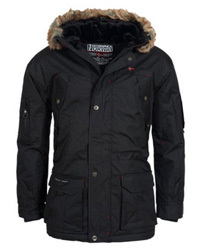 It comes with an adjustable hooded collar and a short central zipper that only closes up the chest part. There are two main pockets on the front part of the jacket, one is an oversized flap pocket and the other a kangaroo pocket that serves as a hand warmer pocket, too. The hem and sleeve cuffs are elasticized and come with a wide, ribbed band that provides not only a better fit, but also helps close the hoodie off from the temperatures outside. There are the brand’s logos both on the chest and sleeves and the colors available include: Navy, Grey, Black. This next design follows the previous design closely and it’s the Gymclass Lady Assort B hoodie, which is suitable to wear during sportive activities outdoors. It, too, is made of 65% Cotton and 35% Polyester and it is a warm and breathable design that provides comfort and is spacious enough to layer underneath. The hood is adjustable with draw cords on both sides and there is a short central zipper on the upper part of the chest. There are two side pockets and an oversized flap pocket in the center. On the center there are also logos, as well as on the hem and sleeves. The hem is elasticized and ribbed for a more comfortable wear and to also prevent the hoodie from moving up and down as you move, and so are the sleeve cuffs. There are many colors to choose from: Beige, Sky blue, Dark grey, Navy, Light grey and Light pink. 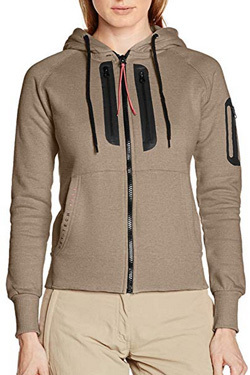 The third design is the Fabricot Lady hoodie, which comes with an adjustable hood and a full-length central zipper. It is made of 65% Cotton and 35% Polyester, with the inside being softer and more fleece-like for better insulation and added comfort. There are two slide pockets on the sides, two zippered pockets on both sides of the chest and one on the left sleeve. There aren’t any flashy logos on the outside, which is a good thing for those that prefer a more laid back and minimalist design. The hem is standard, while the sleeve cuffs are wide and elasticized to prevent the sleeves from moving. You can get this design in the colors: Taupe, Grey, Pink, Navy, Sky blue and Light grey. Flyer Lady is the fourth and last design for women and like the previous one, it, too, comes with a full-length zipper, which is concealed. It is made of 65% Cotton and 35% Polyester and it comes with an adjustable hood as well as two large slide pockets on the sides. 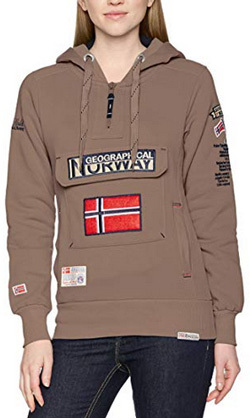 This is a sports hoodie that has elasticized sleeve cuffs and an elasticized hem as well, in order to keep everything in place as you enjoy yourself outdoors (or indoors, too, for that matter). 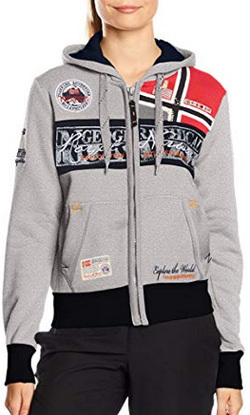 It is a comfortable and warm hoodie that comes with the brand’s logos on the body and is available in these colors: Grey, Pink, Black and Navy. Moving on to the men’s selection, the first design is the Faero hoodie. 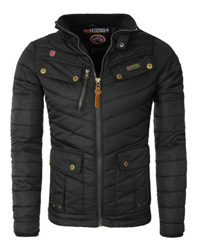 It is made of 80% Cotton and 20% Polyester, making it insulating and comfortable to wear. 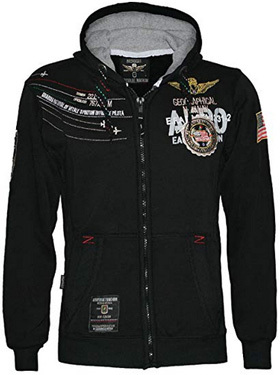 This is a warm hoodie that is suitable for a variety of outdoor activities and it also comes with numerous logos and patches on the chest, sleeves and back. 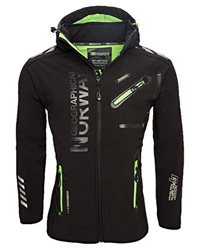 The hood is adjustable and the central zipper is full-length. There are two slide pockets on the sides and both the sleeve cuffs and the hem are elasticized and ribbed to prevent the hoodie from moving up and also for a better and more comfortable wear. This design is available in the color Black. Check out some more men’s hoodies here. Fighter is a warn and light hoodie jacket that is made of 80% Cotton and 20% Polyester. 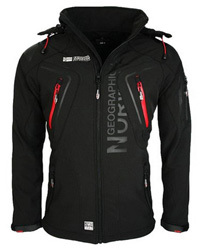 It comes with an adjustable hood and two slide pockets on both sides of the main central zipper, which is a full-length one. The hem and cuffs are elasticized and ribbed, but not as wide as in the previous design. However they help to better insulate this hoodie and to keep things from moving up and down as you move around. 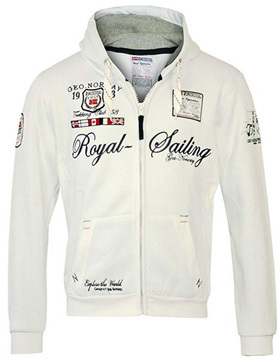 There are numerous logos and patches, related to the Royal Sailing and Trekking clubs. This is a design for adventurers and is available in the color White. The third design for men and the last one for this selection is Flyer, which is the male version of the one we saw previously for women. It is made of 65% Cotton and 35% Polyester, making it an insulating and comfortable design to wear. The inside is soft and fleece-like, while the outside is smooth cotton fabric. There is a slide pocket on each side of the full-length central zipper, which are suitable for warming up the hands and holding small belongings. The hem is elasticized and so are the sleeve cuffs. This is a design suitable to wear in autumn and early winter on its own, but works as a light layer under a heavier coat, and if you were to go a size bigger, it will leave some room for layering underneath as well. There are large patches and brand logos all over the body and two colors to choose from: White and Black.